​Our therapists have put together a few things that you can utilize for yourself or your child in the moments when dealing with sexual abuse becomes overwhelming. Information on how to get involved in our multi-disciplinary efforts and how to make referrals for child clients to JVC. 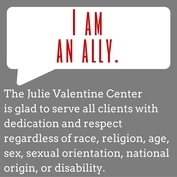 ​Resources for victims outside our service area and victims of other crimes such as domestic violence.